Event Case StudiesConvention Facility Case StudiesWhy is Conference WiFi So Challenging? showNets designs, deploys and supports enterprise network services for the world’s leading industry trade shows, conferences, and convention centers. showNets proudly partners with some of the leading events, event managers and convention centers. Let us build your event network. Since 1998 showNets has been the industry leader in fast, secure and reliable Internet and custom networking solutions for trade shows, corporate events and convention centers. We design, deploy and manage high-density wireless networks that are tailored to deliver each client’s specific needs with rock-solid performance and exceptional service. Our dedicated team of professionals are prepared to deliver what event planners and show floor exhibitors need for a successful event. With an average of 33 years experience in the event networking industry, our staff make the ideal companion to in-house technical teams. Our consulting and project management teams provide guidance on infrastructure selection and oversight for equipment and personnel execution to ensure our client's event requirements are fulfilled by the facility. Unlike other technology providers, we focus on a single service for hotels and conference centers: flawless Internet service and reliable wireless networks. Through our always-on, always-managed networks, we give facilities managers the peace of mind to know their technology will meet the needs of every event. 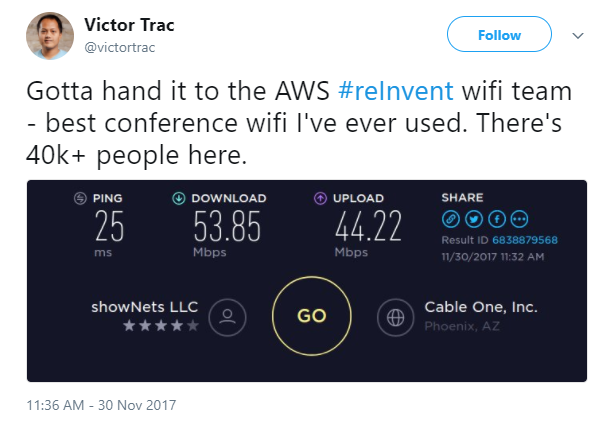 Why is Conference WiFi So Challenging?